There’s something that just fits with having a Wild West theme in your online slots. Maybe it’s the sense of adventure, a history of gambling or it;s just good to see some gunslingers firing the hell out of the reels for kicks. 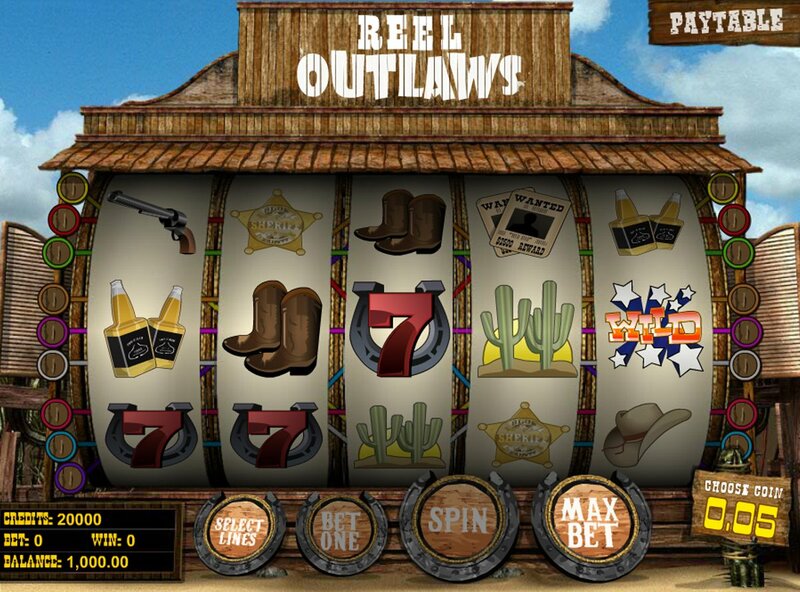 Whatever it is, video slots set in good ol’ America always seem to deliver, and that is certainly the case with innovative slot developer Betsoft Gaming’s Reel Outlaws slot. 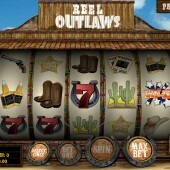 Reel Outlaws is a 5-reel, 9-payline game that’s low on betting but high on thrills. The reels are packed with cowboy hats, cowboy boots, sheriff badges, pistols, wanted posters, cacti, whiskey bottles, red sevens on horseshoes and even dynamite. What’s nice is the gun noise when you spin the reels, and they’re slightly curved like a fruit machine for that extra old-school feel. There are simple – if unspectacular – animation sequences whenever you hit a winning combo. In addition, the Wild logo serves as both the Wild symbol and the jackpot symbol. As a wild, it can substitute for any symbol other than the scatter or bonus. The dynamite is the scatter symbol. Five across the reels pays a 500-coin jackpot. The Reel Outlaws logo, meanwhile, is the game’s bonus symbol, and three or more of those triggers the game’s feature bonus. Once you are in the bonus round, you have to try to shoot glass bottles in order to reveal extra cash prizes. Once you shoot the ‘Collect’ bottle, the game ends and you will be taken back to the reels. This is one of those Betsoft games – a little like the insect-themed The Bees slot – that is light on drama and high on excitement. The animations are OK, the sound FX basic, and the bonus rounds on the stingy side. There are no gamble or auto play functions to speak of, so if you’re after some quick and easy fun, this is for you. If, however, you want a little more meat for your slots, go way out west with Gunslinger from developer, Play'n Go, while Betsoft's 3D gold-digging slot, Black Gold, is another perfectly good alternative to play.